I have recently enrolled for UB tournament organized by Warhammer-Board, a German website community who invited some international players. It is 3 round small event using ETC player's pack. In the first round I had a pleasure to play against Eloriel, one of the organizers of the tournament who decided to bring Beastmen this time (he usually plays WE or DE or WoC). Very interesting list! It is clear that Minotaurs are here to charge, stomp, trample and basically destroy the enemies. They are also well protected with good armor and even better ward save. 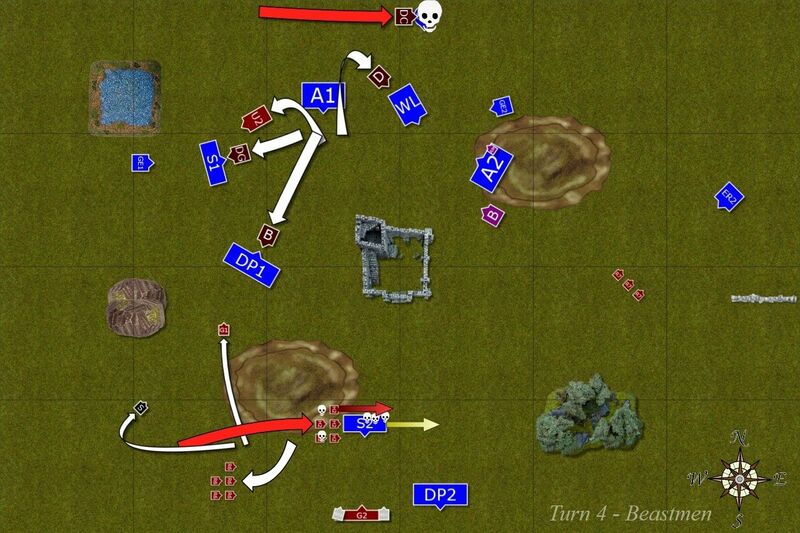 Multitudes of Raiders are to ensure the right placement of the Minotaurs and to block potential reinforcements. With mark of Slaanesh it is great deal as the opponent has to kill them all to get rid of the problem. Addition of Slugtongue with Lore of Undeath is a good trick too because he can affect a few nasty unit on the enemy side (in particular cannons) and then add to the pool of redirectors or even summon some hard hitting regiments too. I decided to take my recent version of the army with a little adjustment due to possibility to play against creatures that can regenerate and blood and glory scenario. Doombull - General - 4+ armor save, 3+ against the shooting, 3++ ward and 2++ ward against flaming attacks. It is very hard to break through these defenses. In particular on a model that has T5 and 5W. Doombull hits back very hard too and every combat he wins adds to the already impressive amount of attacks. What is more, Minotaur characters inflict d3 impacts and stomps are also good to have. Potentially, a single doombull has a good chance of killing entire units of mine in a single combat. I cannot harm it with magic missiles because these are usually flaming attacks. 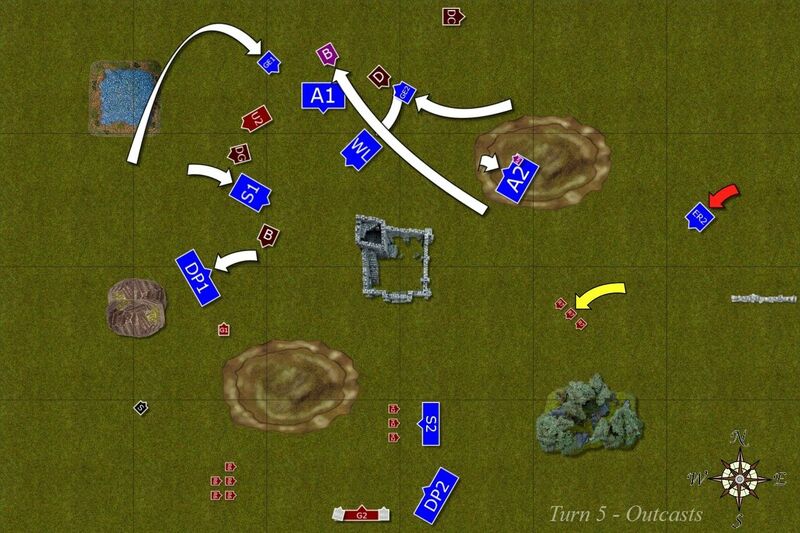 I observed, however, that Elo likes to join units with his characters for time being to better distribute the shooting attacks among his characters and regiment so that they arrive in combat in better shape. Since this character is on foot he can still be diverted. My approach would be to avoid combat with such monstrosities as long as possible and feed them with units that may not be worthy much or would take them out of combat for longer. Doombull - 2+ armor save, 4++ ward save, 2++ against flaming attacks, this characters is the most dangerous model for my army because he also has ASF thanks to his magical sword. He will have re-rolls against Swordmasters and Lions, for example. Same story, has to be avoided although wounding him with single bolts from bolt throwers is more likely than the general of the army. Doombull - Flying Carpet - very fast and dangerous too but with worse protection. 3++ ward save is of course fantastic but 4+ armor save means I can at least try some magic missiles and even regular arrows can be lucky enough. He is also alone and exposed meaning out of three doombulls I have the best chance to target this one and he was my priority. Another reason why I wanted to hunt him down is that he can get to my bolt throwers faster than others. 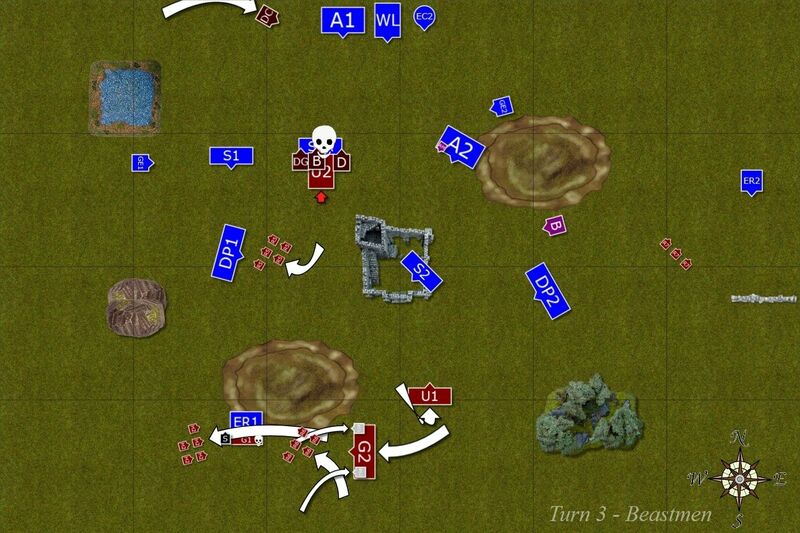 BSB - adds to the killing potential of the army but is the most vulnerable of all minotaurs. Ideally breaking him in combat is the best way to destroy that character but close combat is where the minotaurs want to be. If that happens I would try to direct attacks at him to be able to kill him. This army is Ld8 only so destroying BSB is very important too. Slugtongue - this guy has a potential to cripple my army before the game even starts. That is why I decided to deploy at the very edge of the deployment to make it more difficult for him to reach all the units and hopefully limit the impact of his special rule. Another interesting thing is that he will use Lore of Undeath and that is the first time I would ever face one. In fact, Larry the Loremaster also has a chance to use signature spell from that lore and I might use it for my own benefit. Bray Shamen - this guys are here mainly to provide channeling but shadow magic can be very useful too. They are also worthy some more points than the units and are possible to hunt down so I will look for the opportunities to catch them. Gor Herds - very small units, but Slaanesh marked so they would flee nowhere. They will be protecting the wizards for sure and I expect them to stay behind but with my fast cavalry I have a chance to catch them and will definitely try to do so. Ungor Herds - delivery systems for Minotaurs as due to base size they fit in nicely. Question was how Elo would assign his characters, would they go to a single unit or spread them among two regiments. Potentially provide some wounds to balance the combat results but with huge amount of attacks by minos that might not be enough. It still might be a good idea to shoot at them to get points as well as deprive minos from living shield. Ungor Riders - wow, how many units again? :) the interesting part is that Elo can choose how many (if at all) he wants to have in ambush. These little critters are very annoying because they can shoot, they don't panic and may at least re-direct or simply tie in combat other regiments. I also expect them to interfere with the movement phase so that Minos can reach combats they want to be in. The good thing is that I have units that can comfortably take them out one on one and I will use that advantage. Harpies - also dangerous, very fast and with more attacks, have to be eliminated real quick. Riders are slower and can be blocked, flying units cannot and that is huge difference. My general plan was to deploy far back and use shooting superiority to inflict damage. 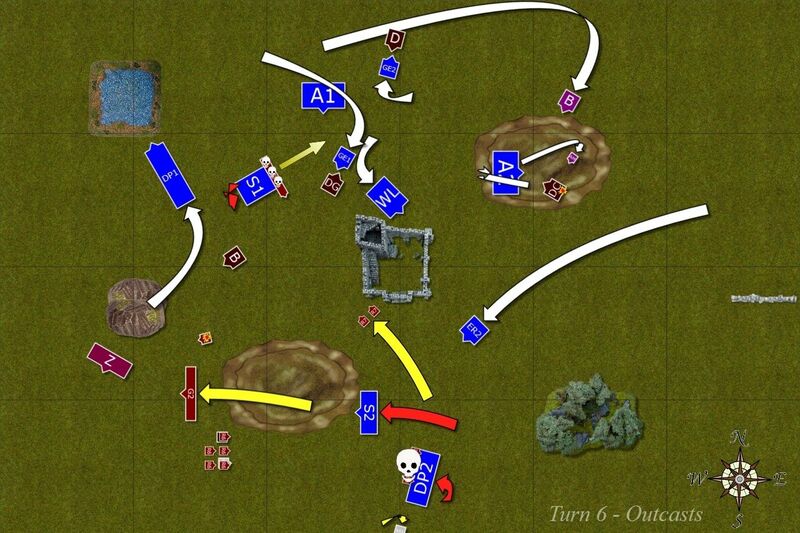 At the same time I wanted to use my own units to outflank the enemy and get around to the wizards that are not well defended and easier to destroy. Since they are all worth 100-200 points each it is a good amount to get some advantage. I would try to destroy all these small units on the way as well and with some bonuses for banners I think I can earn some points to balance out inevitable casualties. At the same time I would delay Minotaurs and re-redirect them using their frenzy to make them go away from my regiments. With some luck I may even be able to hunt down one of them. The map called "Burning down the house"
- Line of Sight: Hills block Line of Sight. 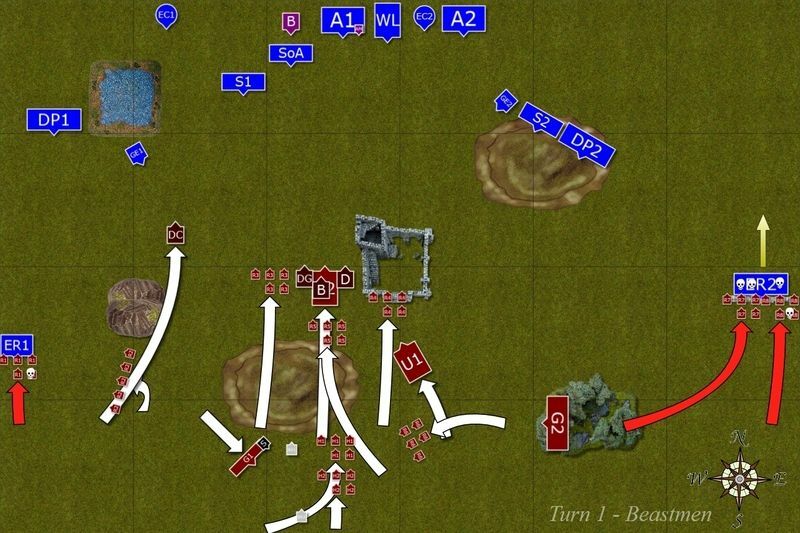 - Line of Sight: Forests are Interfering terrain providing Soft Cover for units, as described in BRB. For Line of Sight purposes Forests count as being of infinite height. This implies that units shooting trough forest will always suffer Soft Cover penalty, even if shooting from a hill or building. - Line of Sight: Lakes are non-interfering terrain features. - Lakes are Water Features. - Walls definition of a unit “behind” is applied only to units actually defending the obstacle (i.e.aligned with it and touching it). 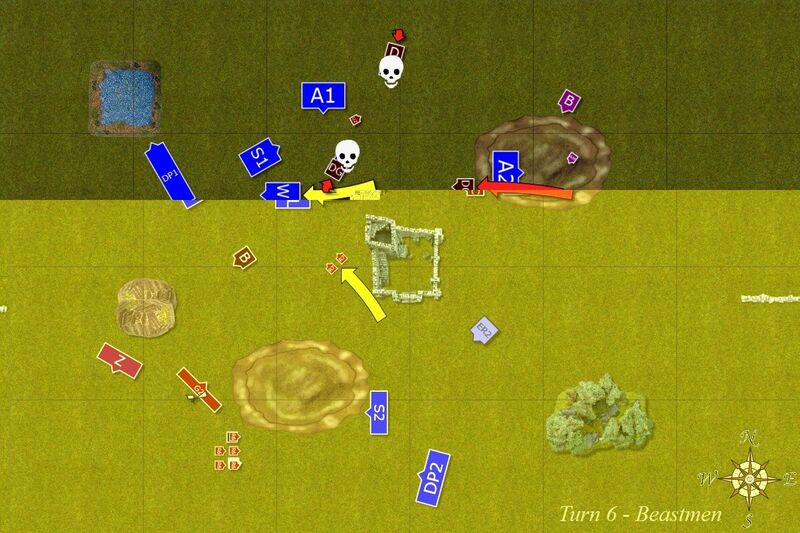 - Line of Sight: Obstacles are non-interfering terrain features. - Ruins are NOT Water Features. 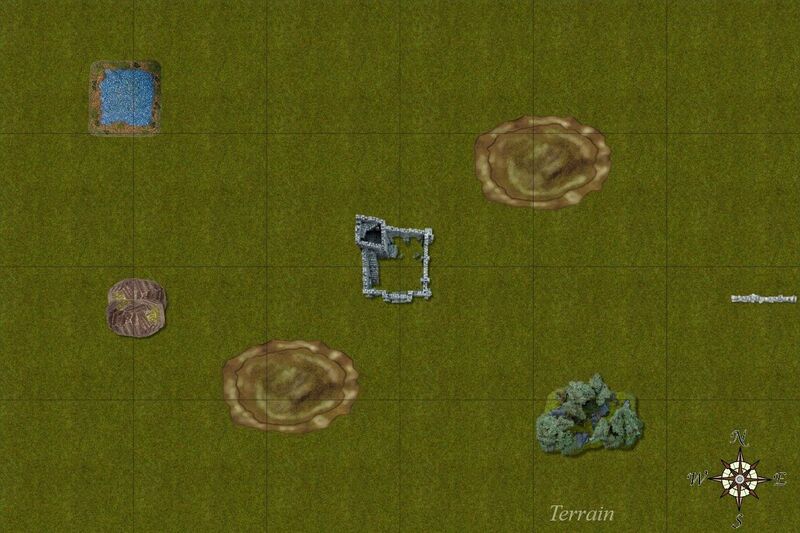 - Line of Sight: Ruins are non-interfering terrain features, providing Hard Cover for all units withmajority of their models in the feature. As the title says - infinite height, impassable terrain. I won the roll off and got the first turn! Elves moved on the flanks in order to envelop the enemy, their favorite tactics. The center remained stationary, the foe was still far away and out of range of the archers. But not for the magic missiles. Larry the Loremaster managed to cast medium fireball at gors irresistibly and used his earthing rod to contain the feedback. Luckily for him he didn't forget his spells thanks to that safety valve! Beastmen used their primal cunning and converged around their big Minotaur leaders that moved forward to reach squishy Elves as soon as possible. Some riders obeyed the orders of Shaman leaders and grouped behind the hill to provide protection. Finally, the riders on the flanks took the fight to the enemy. 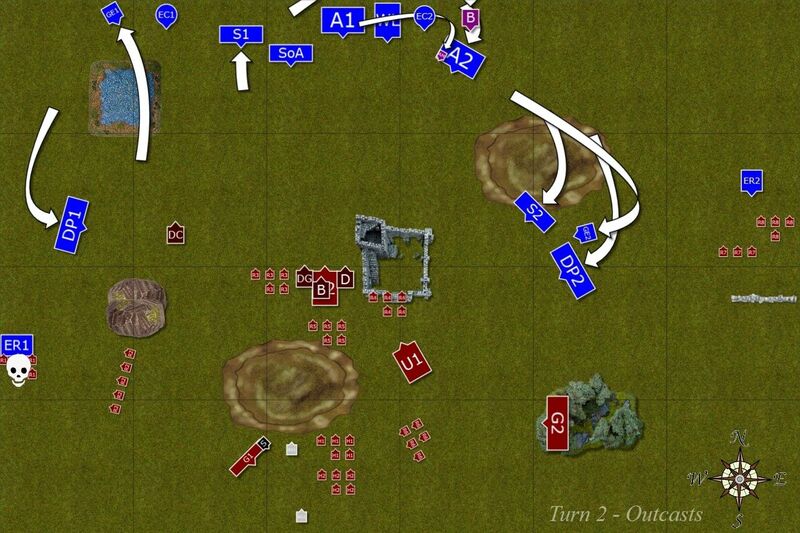 And while the ones on the left flank could not shift the reavers, the bands on the right broke their enemy! Fortunately for the Elves their steeds were fast enough to take them to the temporary safety. Elves continue their outflanking maneuvers and at the same time consolidate their positions in the center. They are already under the direct threat of one of the Doombulls charge but the main enemy unit is still too far to attack. Flying Doombull, annoyed by some Elves shooting at him, charges at the eagle claw and reduces it to splinters (Edit: needed 8+ to charge). Ungors on the extreme flanks try again to get rid of pesky Reavers but this time they lose badly and that puts some of the more vulnerable units in a bad position. Minotaurs rush forward without paying attention to expendable riders even as they rush to intercept outflanking Elves. Beastmen herds become more and more divided. 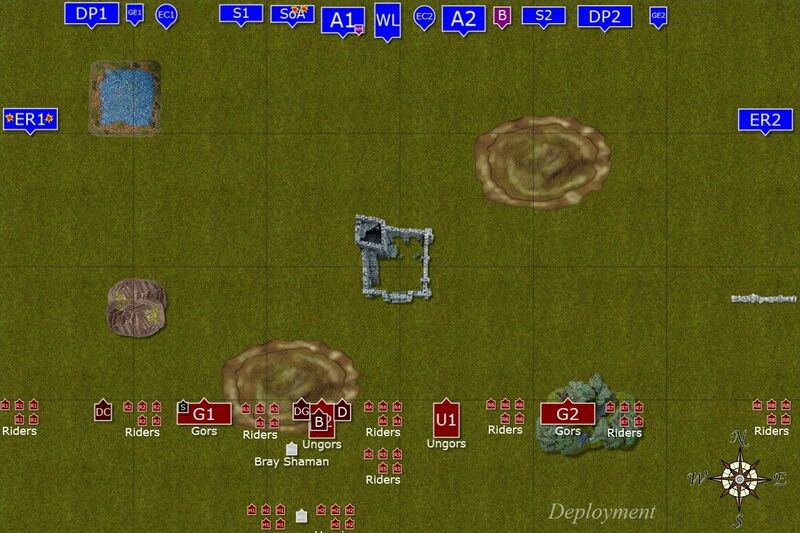 Elven units attacked blocking rider bands. Dragon Princes and Swordmasters defeated their enemies easily. Tired and under the influence of a spell reavers attacked gors with Slugtongue but could not break them. Would they hold long enough for reinforcements to arrive? Minotaurs give in to their bloodgreed! The situation became even more complex. On the North Archers moved forward to distract Minotaurs and to buy more time for the assault units to hunt down vulnerable hordes and enemy wizards hiding on the South. Dragon Princes destroyed their foes again. Swordmasters spotted exposed flank of gors with two enemy wizards and charged in, won combat decisively but didn't catch the fleeing beastmen. Unfortunately, Ellyrian Reavers lost the combat against single gor and Slugtongue, broke and were run down in pursuit. Minotaurs separate to hunt alone! Flying Doombull hunted down second Eagle Claw with easy while his brethren moved out of their pack and started hunting down units individually, each going after different Elven unit. Harpies spotted the chance for revenge when Swordmasters exposed their flank to the attack. The warriors of Hoeth fought well but broke from combat anyway. They were lucky to flee though but it was clear that hot pursuits were a mistake and beastmen wizards will have a chance to escape now. Elven units were hard pressed but they used their superior training to execute well organized march moves and avoid the rampaging Minotaurs where possible. Sometimes it required trusty eagle to distract bloodthirsty beasts. At the same time Larry and Archers tried to inflict some damage at the distance but could not land the killing blow just yet. Four angry Minotaurs moved around again, trying to catch the Elves who kept avoiding them. At the same time Ungor Riders failed to rally and fled through the ranks of Swordmasters who captured one of the creatures. That also meant remaining two were blocking the attack path for the warriors of Hoeth. One Shaman and Slugtongue moved to join last pack of riders and hid behind the hills. Slugtongue finally raised some Zombies to help him out too! Last chance to hunt some beastmen! It was the last chance to hunt down some vile beastmen. Swordmasters charged ungors who held to prevent the attack at their Minotaur boss. They died but single survivor fled! 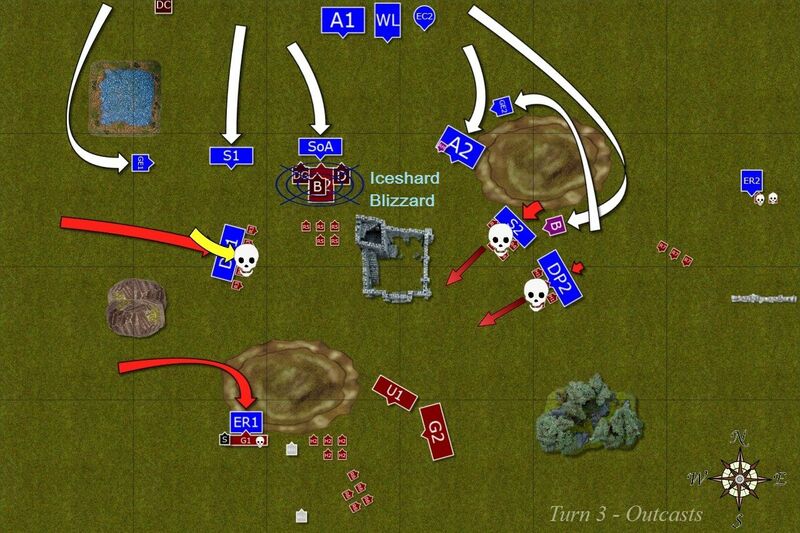 In the South another unit of Swordmasters chased riders away and re-directed into Gors but they fled to safety! Dragon Princes attacked herpies and killed them all. Nearby Shaman thought it was all lost and fled towards the dark forest as well. Larry and Archers tried for the last time to inflict some more damage but while last Gor was pinned dead to the ground, Flying Doombull remained barely alive but alive nonetheless! Great Eagles took one for the team and stopped Doombulls from causing more damage. Wounded Flying Doombull charged White Lions but they decided that they better withdraw as they would have been attacked from the flank and their chances at killing the beast were slim anyway. With that both forces withdrew and regrouped and it seemed that Elves managed to carry the day by the narrowest of margins! 1. 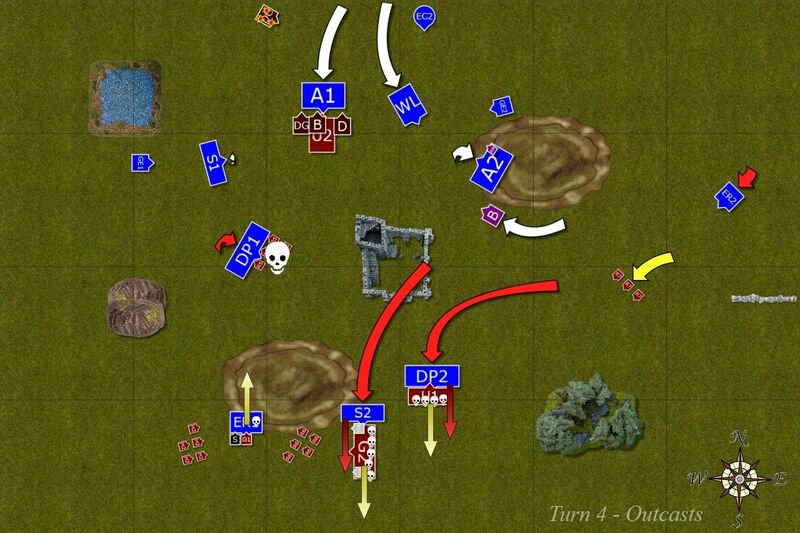 I didn't split the Minotaurs between 2 units. 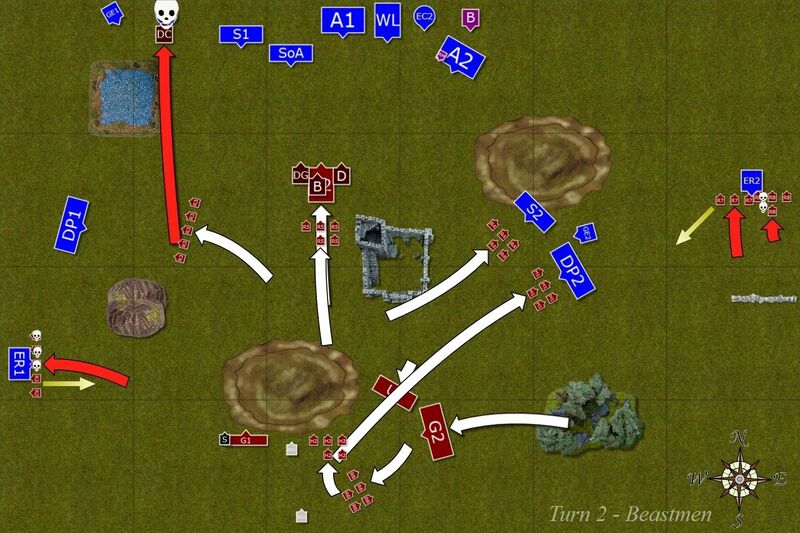 Your regiments don't have the chance against the Bulls and by putting them into a single unit I limited my movement options and could not play aggressively with them. 2. Failed Frenzy test when Sisters of Avelorn where blocking the unit. If passed I would charge with BSB only, move Doombull with Sword of Swift Slaying against the Lions and the General against the Archers. 3. Charging Reavers with Riders, I should shoot at them instead. 4. I didn't bring the redirector to avoid being charged in the situation when Reavers attacked depleted unit of Gors with Slugtongue. 1. Deployment - I was happy with it as I limited the number of units that were affected by Slugtongue by half and didn't suffer many casualties either. The only thing I would change was the relative position of ER1 and DP1 as I had havy cavalry slowed down by the lake where I could not march. 2. Reavers - While I moved them forward in an attempt to outflank the enemy fast and in the end caused lot of trouble for enemy wizards, I wonder if I could have played them better? For example, ER1 could tempt Flying Doombull to charge them, challenge and flee to draw him away from the Eagle Claw. Or even charge him and do the same if he didn't take the bait. When in combat I made a mistake at some stage when I split the attacks between one remaining gor standard bearer and Slugtongue. 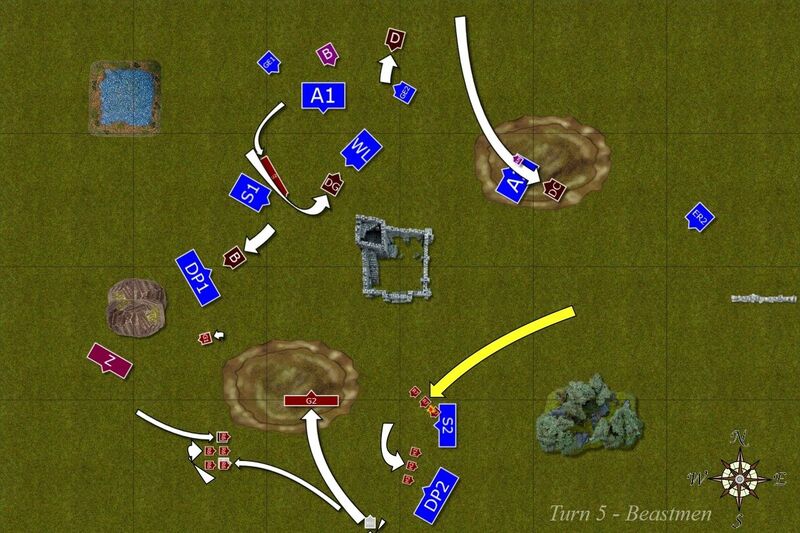 The single attack that wounded was regenerated while it would have killed the unit outright and won me the combat. I may have had broken the enemy then, instead I broke myself and lost the unit. 3. Overruns - I definitely made a mistake with overruning in turn 4. I should have restrained and reformed with both, Swordmasters and Dragon Princes. If I did I would have had more options, attack defeated units again if they rallied or attack/press against fresh targets. As a result I endangered Swordmasters who luckily escaped harpies and totally lost the chance to hunt down all 3 enemy wizards that were quite expensive in comparison. 4. Dragon princes - I left them after defeating the riders where I could press South and help in hunting down enemy wizards. 5. BSB - his main role was to make sure I have the re-rolls for swift re-forms when needed. Fortunately, I didn't but if I failed at least one test these Doombulls would have caught me. I am just wondering if I could position him better to be able to charge something in the meantime. I considered attacking Flying Doombull if possible but at that time he still had 2 wounds left and I am not sure if even with re-rolls I would by pass 3++ ward twice. 6. Lions - that was another thing I am not sure if I did properly. I exposed the flank to Flying Doombull. I decided I better flee and give up half the points (ETC rule) than risk being trampled. Lions and Doombull would strike at the same time. I had 4+ to hit, 3+ to wound with 3 attacks only. Doombull had 8A at this stage + d3 impact hits + stomp. 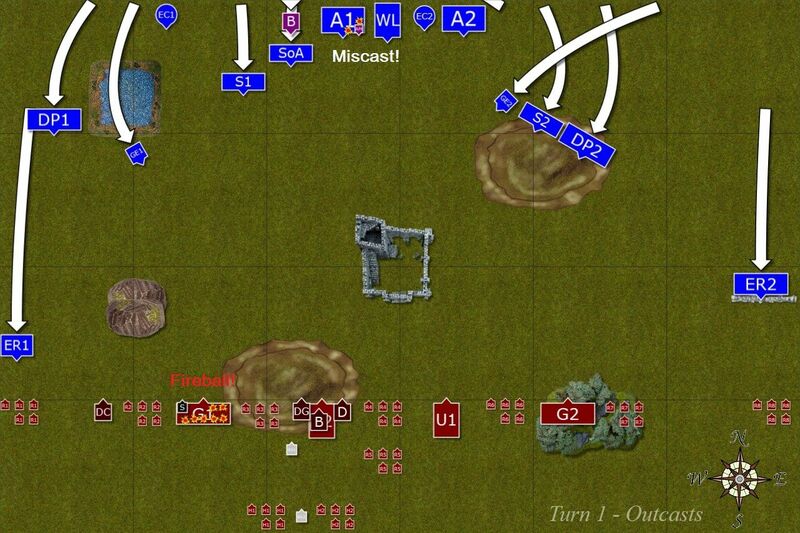 With 3+ to hit and 2+ to wound I could have lost entire unit anyway. That would be the difference between small victory and a draw and while I didn't know the score at the moment I made that decision, I decided to play safe. I hoped to inflict that last wound on Doombull as it would have been great but it was not to be. As you can see there were some points to collect on both sides if not for the mistakes we made so I guess 11:9 is a good reflection of the game. Thanks for reading and looking forward to your comments and feedback! What an amazing report! I really wish I could have been a spectator on this one. I really like those flying carpet characters. You need something that has an impressive statline to compensate for the reduced magic item beefing up, but Minotaurs certainly have what it takes. I've seen Lizardmen Oldbloods and Ogre Slaughtermasters (by Greg from the Hoodling's Hole) do it too and it really adds something fun to these armies. I think your opponent gave you a really fun game and it's nice to see the end result being close. Somehow, it feels like your magic and shooting let you down, but you won the battle mostly in the movement phase. You were able to stall the big boys thanks to frenzy and by the time your opponent got them charge-ready, the battle was almost over and some amazing skill at putting your stuff out of sight manoeuvers carried the day. I do have a question though. This is the second battle you use Bob on a griffon. Do you think it's worth it? You're keeping him out of combat and even if the beast lets the wounds be distributed, your hero is still more vulnerable as a net result. You get your 18" reroll bubble which is nice, but you're having to be more careful positioning Bob so he's safe, which I feel takes a bit of that larger bubble away anyhow. In short, you could put Bob on an Eagle instead of a Griffon and get the same increased size. But with the extra benefit of an extra wound and an extra point of toughness. You don't distribute the shooting against him, so it's not all good news, but with a 3+/4++ it's not all bad? And you'd get 120 points extra to spend on something else. Or, you know, just put him on foot again. Which I feel is the better option anyways. I understand that for MSU, you can't have everything in range of your general and bsb, but I guess I think you should ask yourself if the extra 6" is really helping in this regard, especially considering the need for putting your hero in safety? I often find the games with close results much more entertaining as these with big points difference often seem to be one sided. Of course I had games where the end result was not a good reflection of the tight and bloody battle that has just happened too so it is not a rule! It is hard to say if having Bob on Griffon is worthy just after 2 games but I have two more coming where he was more active :) I am sure it is my inexperience with that type of a character that does not show his full potential yet. Just to clarify one thing, he has 18" range for re-rolls due to Griffon being large target. So if I mounted him on the Eagle he would lose that. It is of course true that Eagle riding BSB has some significant advantages. I am not going to argue pros and cons for both as I think they are actually different and have slightly different purpose despite both being BSB's and sharing the duties. I did think a lot about him in this and I actually decided it is not too bad even against some monster killers. If I happen to lose the Griffon (and with 4+ ward and charmed shield I have good chance to survive) I get back my pedestrian BSB. If he is positioned close to infantry he immediately receives 4+ Look Out Sir. He might even be well hidden from the enemy if not mounted anymore. And while I may lose the Griffon and all the benefits it provides my enemy does not get the points yet! Well I'm already looking forward to see the games in which he's more active then. Good catch about the Eagle, I had somehow supposed that that would also give 18". In any case, I'll withhold my judgment on the Griffon for a couple more games then. At the very least, it's 100% true that it adds a bit of glamour to the army! I think it is the consequence of having more units that means I simply have to test more often. Of course there were also some spectacular fails where many units fled at the same time or there was some kind of chain reaction.